With my lengthy history as a Mariners fan, I should've gotten to know Carlos Lopez by now, but for some reason I haven't. 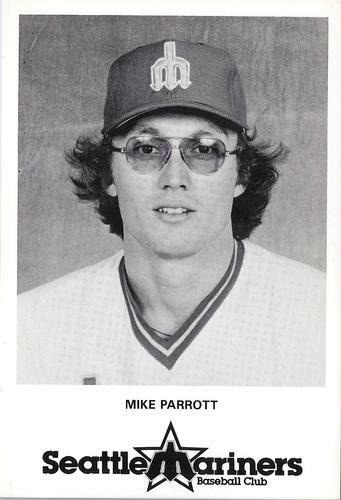 I might've even known off the top of my head that he played 99 games for their 1977 expansion squad and was traded thereafter in a swap for pitcher Mike Parrott, but I didn't. Hmph. Given this limited knowledge, my thanks to the 1978 Baseball blog for the (above) happy-go-lucky scan of Carlos Lopez and check out that powder blue Seattle expansion uni. The only way to make Carlos any bluer would be to print him entirely in blue ink. Which is what (below) today's type card did. Caruso printed a lot of 70s team sets and some render better than others. All that stars & stripes bunting is a fine nod to the 1976 USA bicentennial, but you need red bunting with the white card and blue player to complete its "AMERICA!" effect. All that green bunting puts me off my hot dogs and apple pie. As a player, Carlos Lopez did a lot more than pose in blue and green. 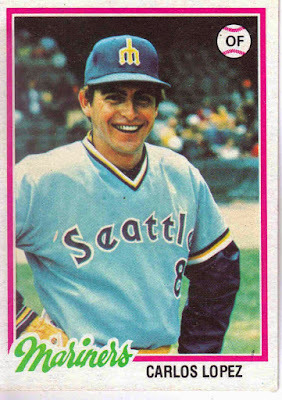 He played at least 17 seasons of pro baseball, starting as a fresh-faced Mexican Leaguer in 1969, "peaking" in the US as an Angel, Mariner, and Oriole (1977-79), and returning to the Mexican League for his 30s (1980-1985). His known career stats tells a story lived by many Latino players, who traveled far from home to follow their horsehide dreams. Compared to Carlos, I know a lot more about aforementioned trade-mate Mike Parrott, who's still coaching in the PCL and "putting sanity to the test," as pitching coaches do in a league known for its hitter-friendly environments. Check out that linked article for a nice look at Mike's state of mind after 40+ years in pro ball. Value: After years of watching eBay for Caruso singles, I nabbed Carlos in early 2019 for $2 + shipping. None of the 1976 SLC Gulls became a MLB star, so others should cost about the same. Fakes / reprints: Caruso cards use thin white stock and were sold at ballparks in bagged, complete team sets. Haven't seen any Caruso fakery in the marketplace, but minor league cards of future star players are vulnerable to it, so be aware of that chance, if you prefer to purchase type cards of well-known players.